Japan is at the top of many travellers bucket list, and for good reason. It was at the top of mine ever since I read Memoirs of a Geisha, years ago. 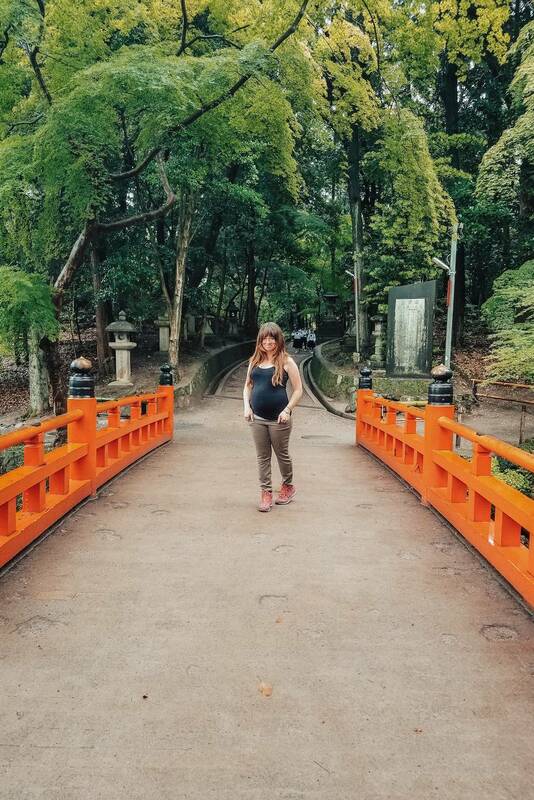 So, earlier this year, when my husband and I booked our trip to Japan with G Adventures, I was extremely excited to finally get to explore this magical island and share our Japan travel tips with you. After spending only a day in the country, I fell in love. I think that was partly due to the fact that I became quickly obsessed with their toilets. More about that later… The best way to explain Japan to another traveller is to say that it has the stimulation of India, the cleanliness of Singapore and the calmness of well, itself. I’ve never been to another country that felt as peaceful and laid back as Japan, even in the major cities. My husband Siya and I only had 8 days to spend in the country, but we wanted to experience as much as possible, without feeling too rushed. 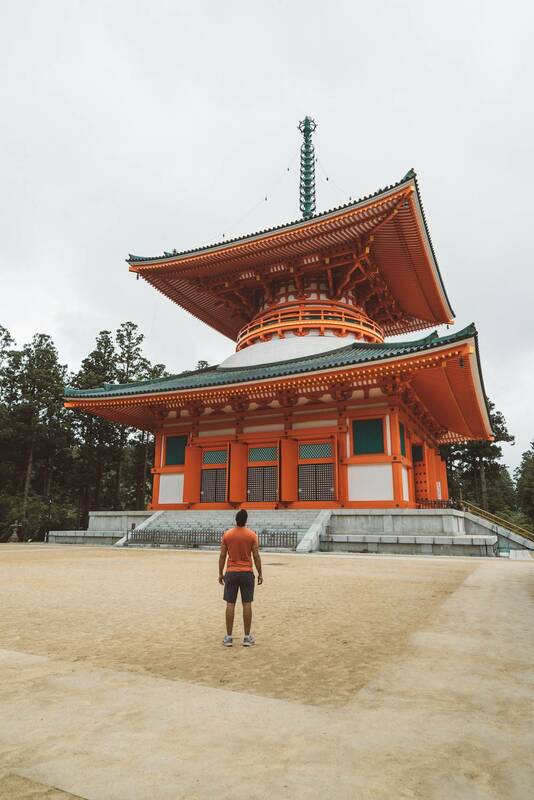 We found the Japan Express tour with G Adventures to be the perfect balance of exploration, diversity and relaxation. 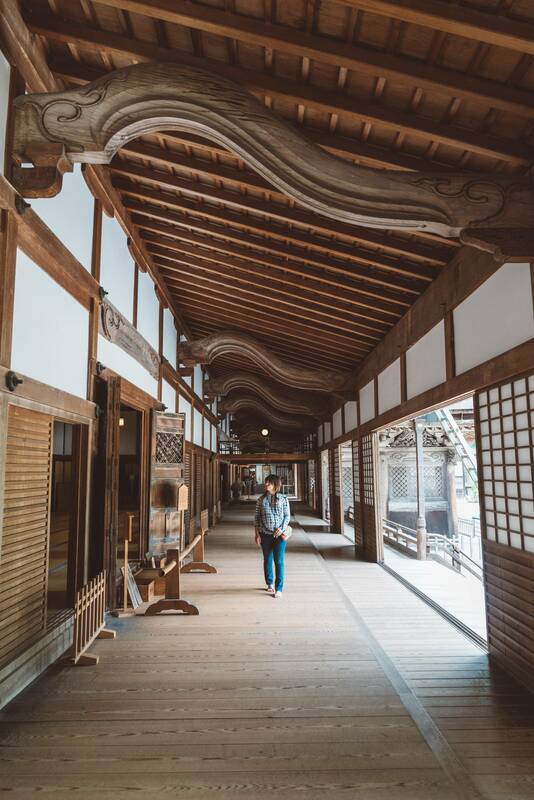 In this Japan Travel Guide, I share the top 10 Siya and I did throughout the week that we'd highly recommend. I also include pricing to make your travel planning easier. Public transportation is the fastest and cheapest way to get around Japan. If you haven’t heard of the Japan bullet trains, you’re in for a treat. These trains are fast, like the speed of lightening fast (well not quite, but really, really fast). Japan is in fact, home to the Maglev, the fastest bullet train in the world. Travelling at record speed of 603 km/h (375 mph)! We travelled from Kyoto to Toyko on the Nozomi, which is the fastest Shinkansen line, in 2 hours and 20 minutes. If you were to drive this distance, it would take approximately 5 hours and 30 minutes. JAPAN TRAVEL TIP: If you plan to travel all over Japan, I would recommend getting yourself a Japan Rail Pass for the week for about $339 CAD (if you're on the G Adventures tour, it's included in the tour fee). The pass gives you unlimited travel on Japan Rail trains. In no way am I exaggerating when I say Japanese toilets will change your life. The entire experience, from start to end, will leave you smiling from ear to ear as you walk out of that washroom stall. Everything is automatic and fantastic. The lid will lift for you, and the seat will be heated. Upon relieving yourself, you will have the option of spraying your front or back end with a built in bidet that will spray you clean. No toilet paper necessary. Some toilets even have a dryer for after the spray and built in speakers playing relaxing music. You'll never want to leave, or at the very least, it will be hard to. A unique experience in Japan is sleeping in a Japanese temple called a Monestary. Here, you can immerse yourself in the atmosphere of monastic life. 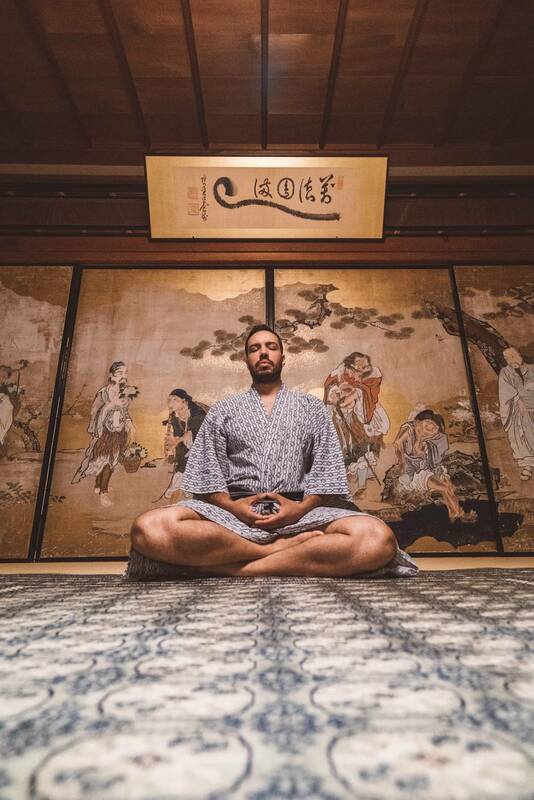 On our G Adventures tour, we stayed at Ekoin Temple where we slept on a traditional bed made up of a futon and down filled blankets, attended evening and morning meditation, ate a traditional Japanese dinner and breakfast and even attended a fire ceremony. Shukubo, which literally means "sleeping with the monks" is a must experience during your trip to Japan. Cooking local with a local is one of the best ways to truly immerse yourself in a new culture. I almost always take a cooking class in each country I visit, and Japan was no different. Although the cooking class wasn't part of our G Adventure tour, our guide helped us arrange it during our day on Miyajima Island with Okeiko Japan. Siya and I got our hands dirty making simple, yet satisfying Omusubi. The class lasts around 30-minutes and costs $52 CAD per person. 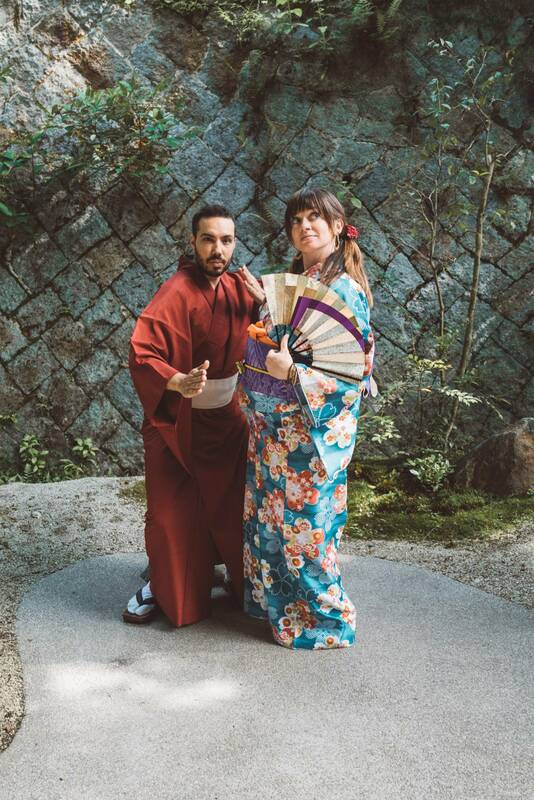 However, we participated in the 3-part experience which also includes dressing up as Geisha, calligraphy lessons and a tea ceremony for $82 CAD per person. 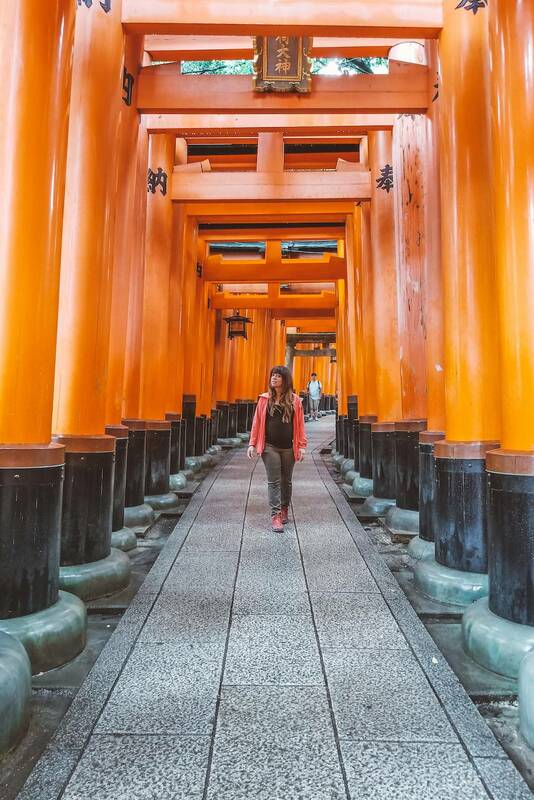 Book the Japan Express Tour with G Adventures By Clicking Here! 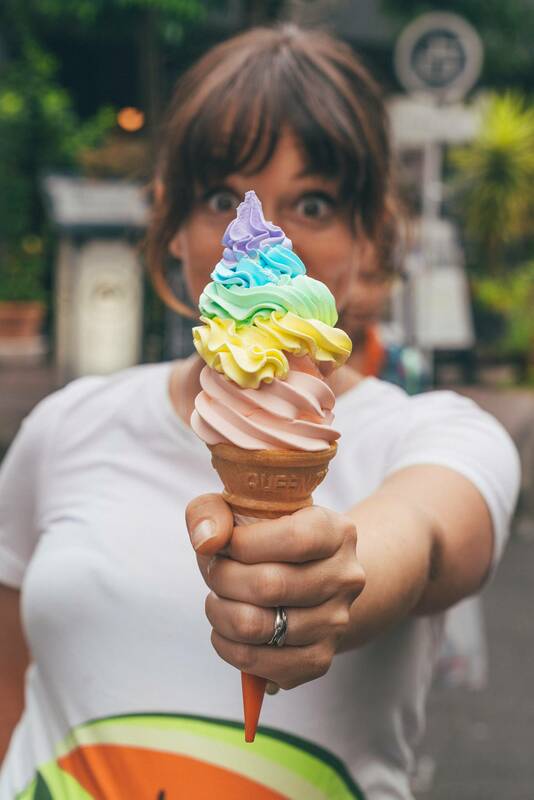 What real Japanese travel guide would be complete without touching on the best places to eat? Now, when most people think of Japanese cuisine, sushi and ramen might come to mind. But, Japan's culinary experience goes far beyond these common Western choices. One dish that really won me over is Okonomiyaki. Some other favourites include steamed buns and Omusubi stuffed with seaweed. 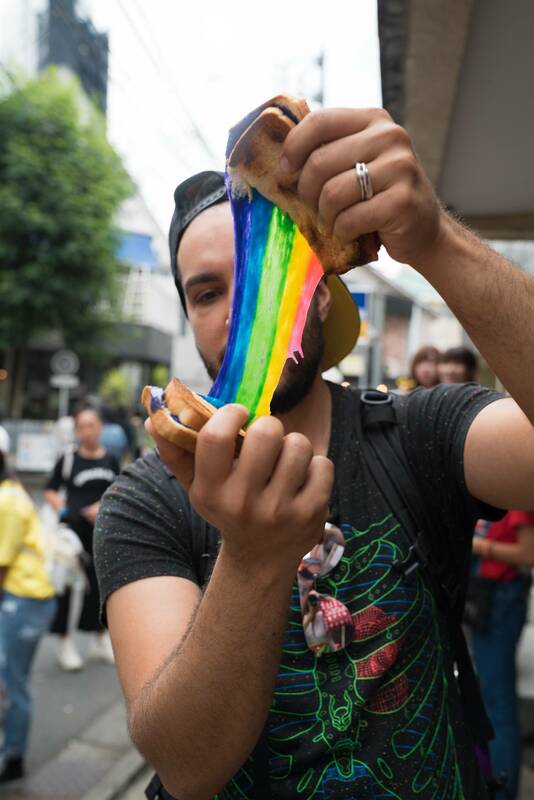 Japan also has its fill of strange and bizarre foods like unicorn poop grilled cheese, gold ice cream, natto (fermented beans), fugu (pufferfish), shiruo no odorigui (dancing ice fish) and shirako (male cod genitalia and sperm), to name a few. There are many beautiful Buddhist temples to visit while in Japan. Every Japanese municipality has at least one temple, while large cultural centres like Tokyo or Kyoto have several hundreds. My favourite was in Tokyo at Meiji Shrine where there was a structure of hanging pieces of wood that read visitors hopes and dreams. Siya and I spent an hour reading through them. We found that most visitors wished for good health for themselves and loved ones, opportunity to travel and freedom. It's amazing how much we all have in common, no matter where in the world we come from. At many temples, there are places where you can receive your love and life fortune on a piece of rolled up paper. In Japan, your fortune isn't like a Chinese fortune cookie where everyone reads positive. In Japan, you can also unravel a bad fortune. That doesn't mean you have to own your bad fortune or even take it with you. If you do get a bad luck fortune, you simply tie it to a tree or to a designated “leave behind fortune” area, and the bad luck will blow away with the wind. This wouldn’t be must of a Japanese travel guide without a section on Japanese superstitions! Rooted firmly in the culture and history of Japan, superstitions are a crucial ritual and belief of many Japanese people. For example, if you find a pine needle with 3 needles rather than the much more common 2 needles, it is said to bring you good luck. It took Siya a whole 2 minutes to find one while searching at a temple in Osaka. I, however, didn't have much luck. Have you ever come face-to-face with a deer? What about two deer? Ten? Well, on Miyajima Island, you will come face-to-face with COUNTLESS deer. For me, this was especially exciting since deer are my spirit animal. Miyajima Island is a 15 minute ferry ride from main land Hiroshima and is one of the top three scenic spots in all of Japan. There's a lot to do on the island, but my favourite was trying all the delicious Japanese food and souvenir shopping. Miyajima Island is also where we attended a traditional tea ceremony, dressed up as Geisha's, learned Japanese calligraphy and took a Japanese cooking class. You can easily spend an entire day exploring the island, taking in the beautiful views and even doing quirky things like visiting an owl cafe. I absolutely love travel books and ever since I read Memoirs of a Geisha over ten years ago, I wanted to visit Kyoto. This highly visited city is as magical as I hoped it to be. Walking through the streets of Gion, trying to spot a real Geisha (also referred to as Geiko in Kyoto) is one of the best treasure hunts. I passed by several Geisha schools, private tea rooms and was lucky enough to spot a real Geisha on her way out from her Okiya (special Geisha house). I've met several celebrities in my life, but have only ever felt star struck twice. Once when meeting the Dalai Lama in India and the other when spotting this Geisha. If you're hoping to see a real Geisha, the best time to spot one is in the early evening, especially on weekends and holidays. One of my wishes in life has been to go through the training of becoming a Geisha. While visiting Miyajima Island for the day, I kind of got to fulfil that fantasy...well it was a good start. As part of the cooking, calligraphy and tea ceremony course I signed up for, I also got to dress up in Geisha clothing. The process took around 15-minutes with two very experienced women working on me at the same time. It may have taken a bit of extra time since they had to work around my baby bump to make sure the kimono wasn't too tight. The end was result made me smile from ear to ear. The fabrics, colours and entire process was a work of art and such a cool experience to have while in Japan. Just as becoming a Geisha has been my fantasy, attending Samurai school has been Siya's. So, while in Kyoto, Siya took a two-hour Samurai training course at Kyoto Samurai School for $80 CAD. In Siya's words: "This was a childhood dream come true. 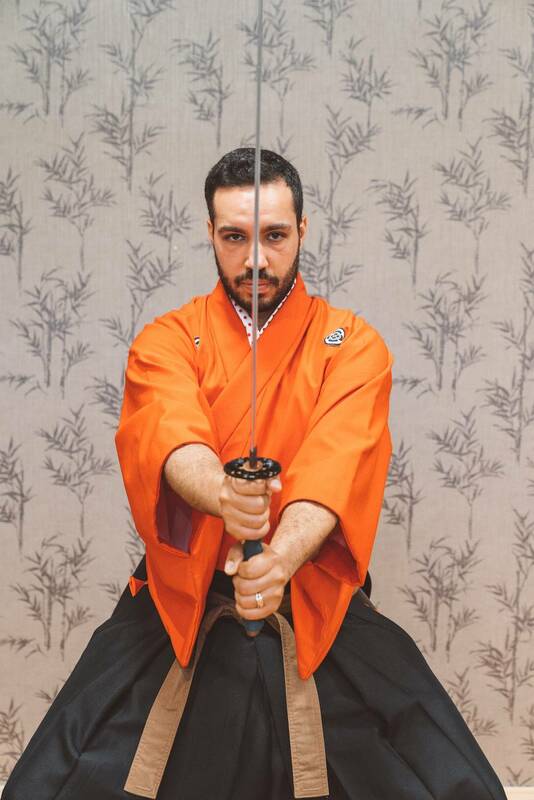 I've taken martial arts in my life like Tai-Kwon-Do, Capoeira, Kick Boxing and Jiu-Jitsu, but learning the art of the Samurai was a completely different style. It's a combination of eloquent movements and deadly blows, while being undetected by the opponent." Japan is one of the most artistic countries I've ever visited. From the architecture to the clothing, from the food to the body movements and facial expressions, Japan is art. 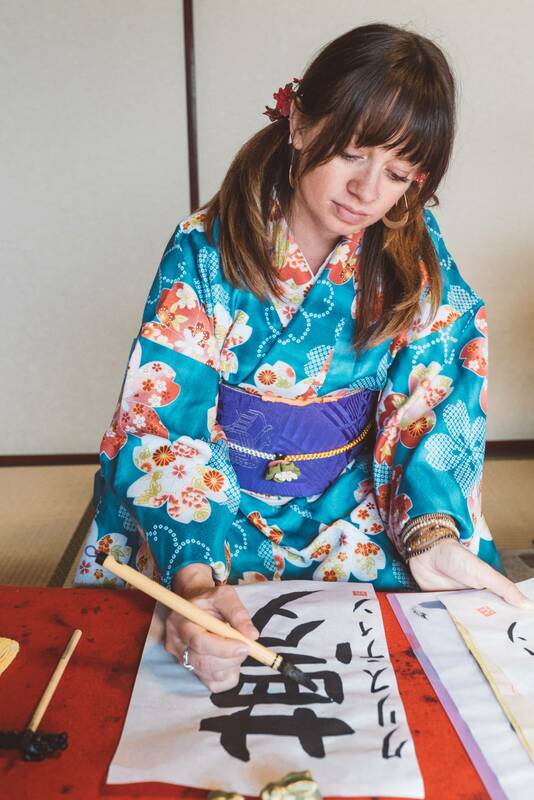 One of my favorite Japan travel tips, that also helps artistically express yourself during a visit to Japan, is calligraphy. The art of calligraphy has long been highly esteemed in Japan. On Miyajima Island at Okeiko Japan, you can take a 30-minute calligraphy lesson as part of a two or three-part course. Using a bamboo brush and Sumi ink, you will choose your favourite Kanji (Chinese Character) from the sample and sign with Katakana (Japanese alphabet). 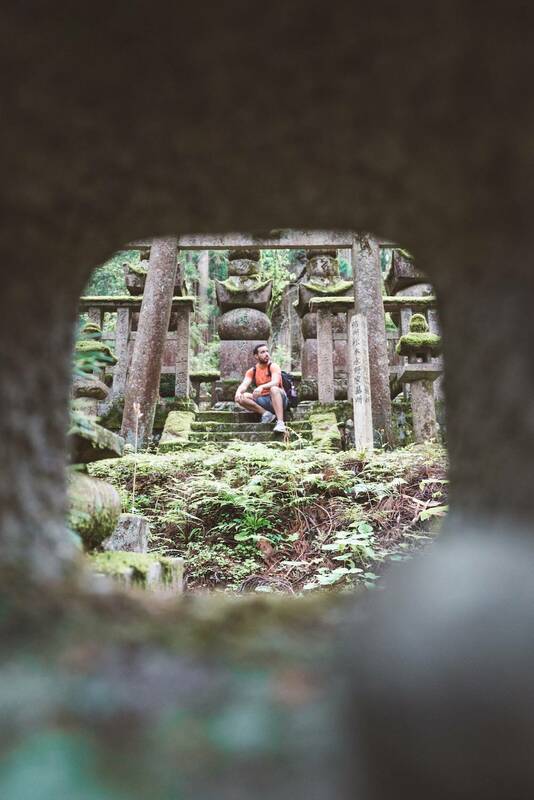 Okunoin isn't your ordinary cemetery. It's the most beautiful cemetery you may ever come across on your travels. I know it was for me. 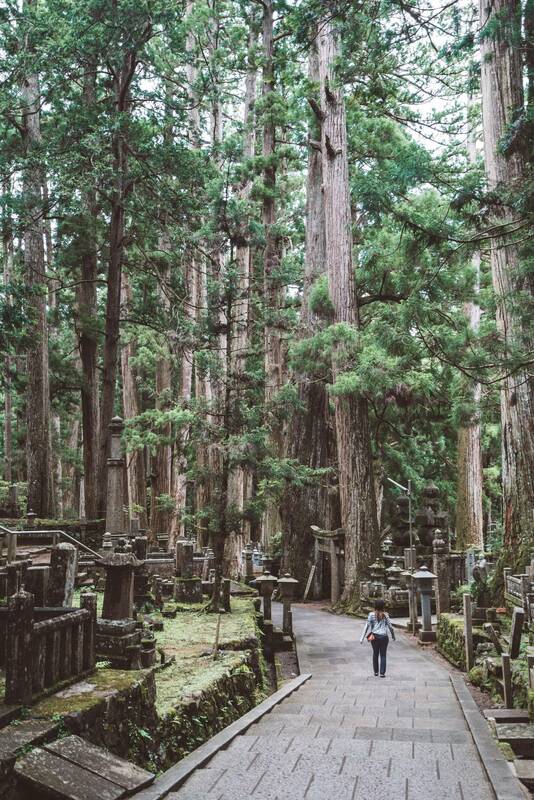 Located in Mount Koyo, the Okunoin Cemetery is located amongst an ancient forest, with massive trees and moss covered ground. It's the largest cemetery in Japan, with over 200,000 tombstones lining the almost two kilometres. Many people, including prominent monks and feudal lords, have had their tombstones erected here over the centuries. It's one of the most stunning and tranquil walks you can take in the country. 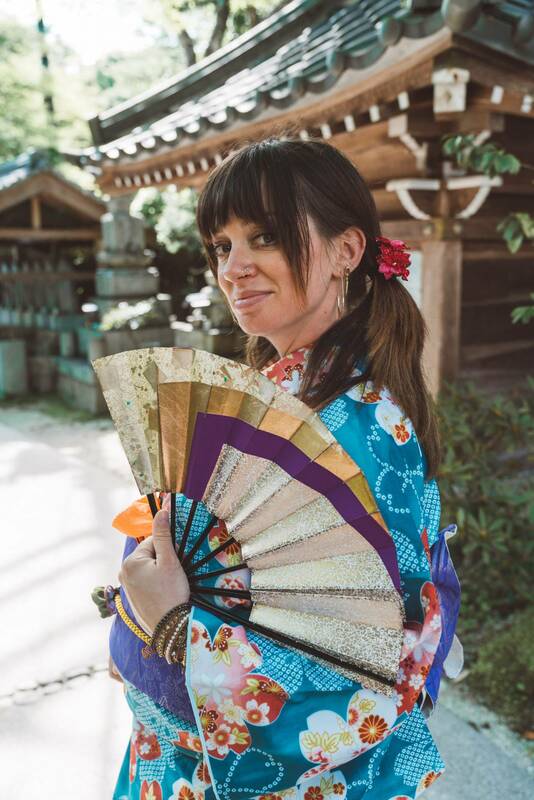 Did you enjoy our Japan travel guide? What things are you most excited for during your trip to Japan? Tell us below! Next Post What To Eat In Japan: 10 Must-Try Japanese Food Experiences. This is amazing and really helpful! Would take note of this in our up and coming japan trip! That was so well written. Thanks for sharing your travel story. It will really help me plan my trip. This is the first time I am visiting your blog and I am highly inspired and motivated. Wish you a Happy New Year and Happy Traveling. I think you should mention that the Nozimi train is NOT covered by the JR pass. Awesome tips, and funny photos! Hope to visit Japan soon! You had me intrigued at dancing ice fish. What is this exactly? Also, love your photos! I am literally starting my own comedy travel blog and you inspire me!!! My blog isn’t even ready, but every time I get afraid or too anxious about it, bloggers like you make a real difference. Thank you!!! That’s amazing! Make sure you share it with me because I LOVE comedic writing. I’m glad I can help inspire you. I’m excited for your journey ahead. It’s such an interesting country. I can’t wait to go back. There way too much to see and do, you could spend years exploring. I loved loved loved this video, So intriguing, beautiful, and fascinating. I have had a fascination for Japan since grade school, when we studied it in grade 3. Thank you for sharing your experience.